The Sumitomo HTR A/S P01 tire is designed as a high performance all season model, but with the advanced technology and features of tires costing much more. The silica tread compound combines with a directional tire pattern to increase traction on dry or wet pavement. The tread blocks and center rib give this Sumitomo tire much better stability even during hard acceleration. There are also deeper circumferential grooves that proved added confidence on rain soaked roads because the chances of hydroplaning are greatly reduced. Another thing you’ll notice with this model is in how quiet and comfortable the ride is. This is due in part to Sumitomo’s Jointless Nylon Band technology they use in the carcass. 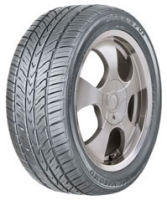 Prices for this Sumitomo tire range from a low of around $55 for the 14″ series, to approximately $125 for the larger 18″ model. Who Are Sumitomo HTR A/S P01 Tires Designed For? Sumitomo has designed the HTR AS P01 tire for drivers of sports cars, family luxury sedans and coupes who are seeking a high performance all-season radial tire that performs well in all driving conditions. Sumitomo tires backs up the HTR A/S P01 with a 5 year or 65,000 mile treadwear warranty for their 65/60 series tires, or a 5 year, 40,000 mile warranty on the bigger 55/50/45/40 series tires. In addition, Sumitomo includes a first 2/32″ of wear uniformity guarantee, and a 5 year guarantee (from week it was manufactured) against materials and workmanship. The warranty provides for free tire replacement for the first 50% of wear, followed by a prorated amount for the remaining tread depth.